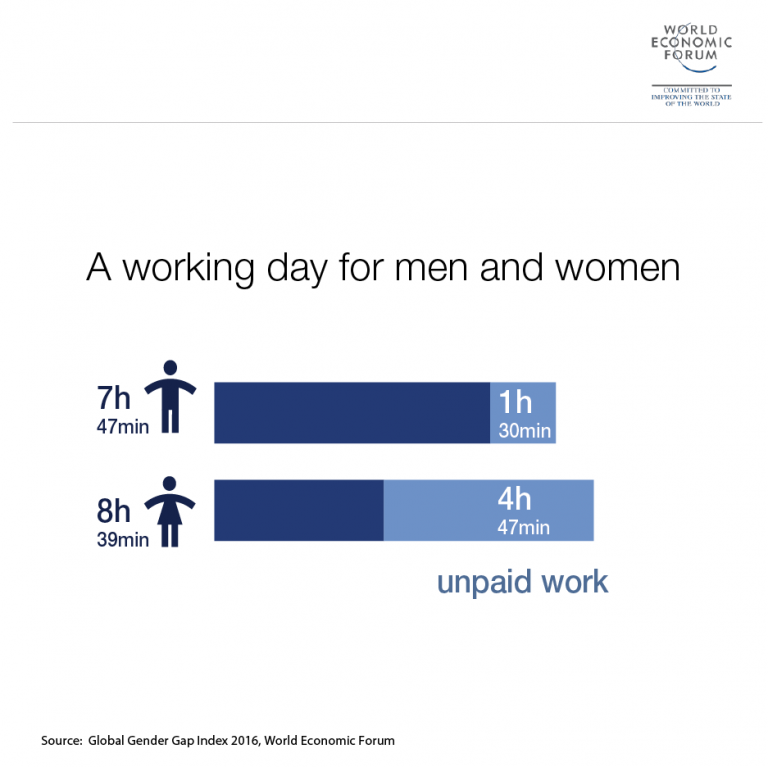 Women work an average of 8 hours and 39 minutes a day – nearly an hour longer than men, when both paid and unpaid tasks are taken into account. 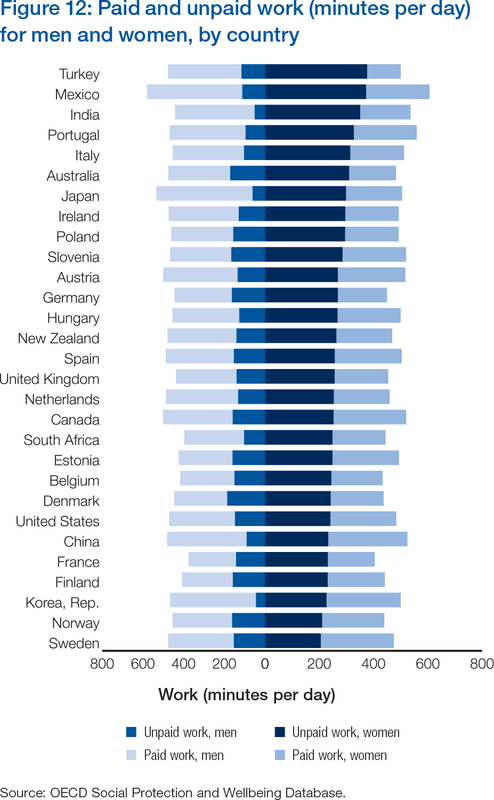 Research from the World Economic Forum’s Gender Gap report based on an OECD study of 29 countries showed that men got off relatively lightly, clocking up 7 hours and 47 minutes a day. While men spend longer hours in paid work, at an average of 6 hours 17 minutes a day versus 3 hours 52 minutes for women, the daily grind of unpaid care work still falls disproportionately on women. “In many societies, even as women have entered the labour force, they have also retained primary responsibility for unpaid work such as care-giving and household chores,” the Gender Gap report states. This tallies with US research showing that working women pay a penalty for motherhood, typically suffering a pay cut of 4% per child as they shoulder a “double shift” of professional work and parenting. However, the picture varies between countries, showing that the right policies can tackle deeply ingrained stereotypes that paint men as breadwinners and women as care-givers. The gap between men and women’s unpaid work was narrowest in Sweden and widest in Turkey, out of a set of 26 wealthy and three emerging economies. Parental leave, flexible work and access to affordable, high-quality childcare help to level the playing field for men and women – at work and at home. In Sweden, for example, new parents are entitled to 480 days of leave, of which 90 days are reserved for fathers. Mothers earn less than women without children. But why?